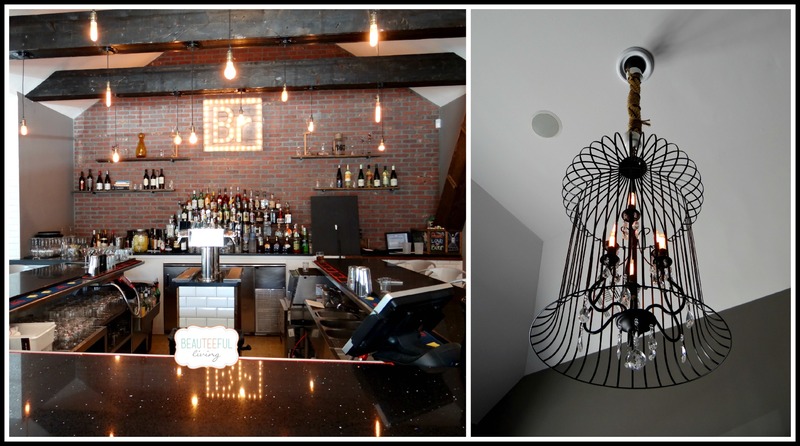 Recently, my husband’s cousin, Roger and his business partner opened Brewology, a gastropub located in Speonk, NY (Hamptons). Although interested in the restaurant industry for years, it was only less than a year ago that Roger took the idea seriously. The day came when a vacant spot emerged near Roger’s route to work. It was the perfect spot for a new restaurant — his restaurant. 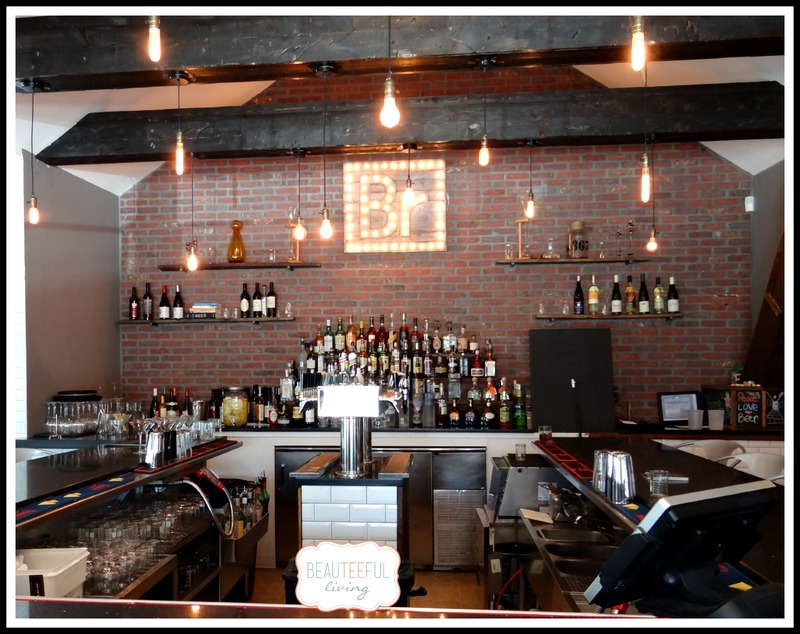 Together with his business partner, through direction of industry specialists, Brewology first opened its doors this past June. Beer – Brewology got its name from the actual term “brewology,” which refers to the study of beer and beer-making. Over at Brewology, they focus on small-batch, craft beer. Their beer menu is ever-changing along with the seasons. For example, pumpkin beer is currently available. Food – Executive chef Lia Fallon (identified as one of Newday’s 2014 all-star chefs), leads the team with an expertly prepared menu that utilizes fresh, local ingredients. Like the craft beer, Brewology’s food changes along with the season. The one constant is that the food menu pairs well with the flavors in the craft beers available. Decor – The interior design falls under the “French Industrial” theme. 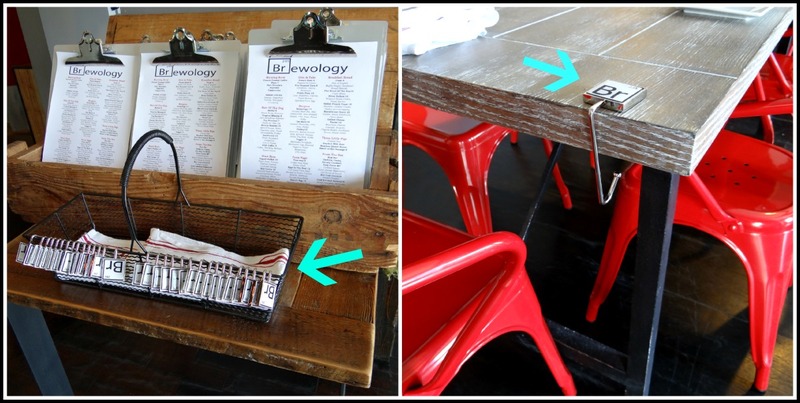 Brewology’s furniture and most of the decor were hand built by local craftsmen using recycled steel and reclaimed wood. 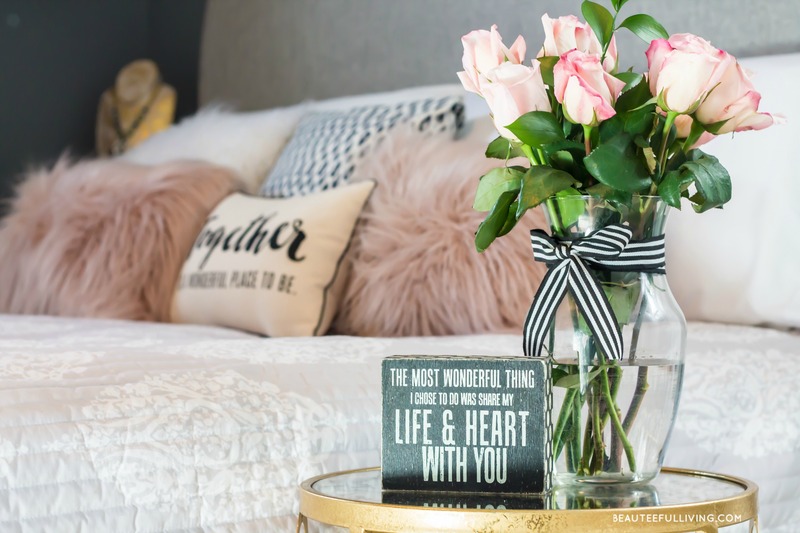 The end result is an inviting space with a chic and modern ambiance. I had the pleasure of visiting Brewology a few weeks ago, resulting in a happy stomach and plenty of photos. The photos, I’ll share in this post. 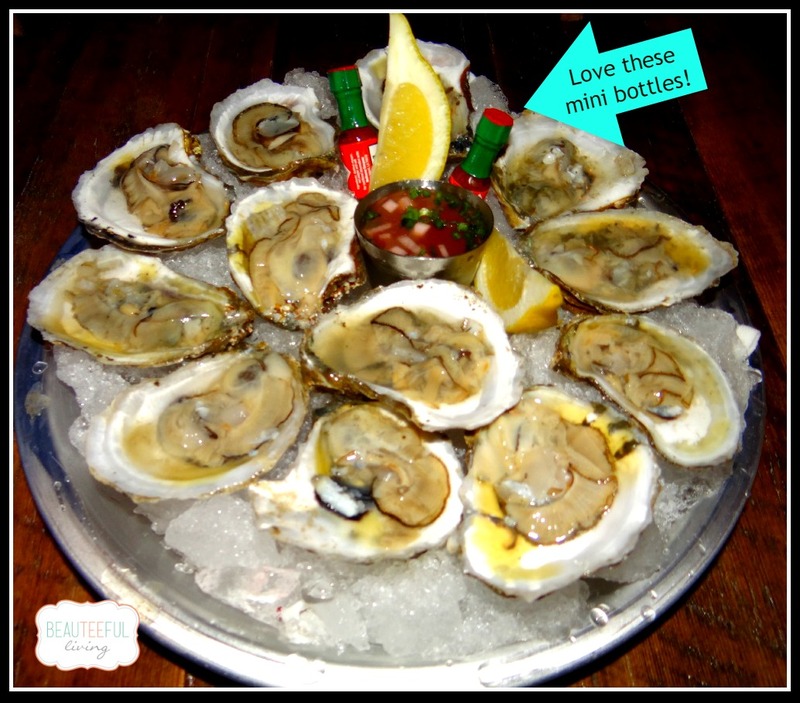 1) Oysters on the half shell. This platter was screaming my name. The oysters were cold, fresh, and clear (exactly how they should be). The homemade mignonette sauce was also delicious. Bonus: Our own Tabasco sauce bottles! 2) Charcuterie. Serrano ham, Tuscan salami, Duck pastrami and mousse. (Duck pastrami — how clever and unique! Tasty too.) 3) Sweet and Sassy Shrimp. This was gone in 30 seconds. So good! 4) Deep Fried Ribeye, Smoked Pork Belly, and Chicken and Waffles. Comfort meal never tasted this good. The smoked pork belly made a big impression on me. You can definitely taste the smoky flavor infused into the pork. Deep fried ribeye? You had me at deep fried. 5) Craft Beer Sampler. I won’t even pretend I know anything about beer. I’m a wine and cocktails kind of gal (I had a refreshing watermelon cocktail). But how cute are these beer samplers? Ties in with the theme of beer as a science. Beer lovers, this is for you! 1) The Entrance. Yes, very French industrial. 2) Details, details, details. I love them! They are important to me. Imagine as a female diner, how lovely it is to receive something to hold your handbag? Oh, I’m sure it works for man-bags too. 3) Dining Room 1. When you enter restaurant, this room will be to your right. 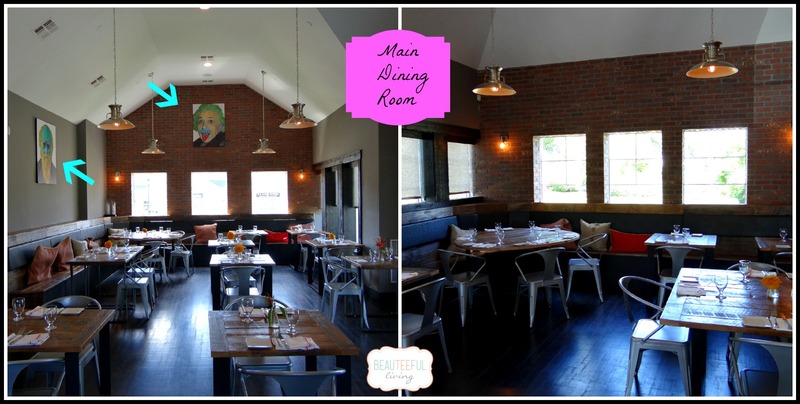 Love the chalkboards and the bright, glossy chairs. 4) Main Dining Room. Notice the famous scientists on the wall. They were painted by a talented friend of the owners. Needless to say, I fully enjoyed my recent dining experience at Brewology. Please know that credibility means the world to me. I may not know much about beer but when it comes to food, I can’t say my taste buds have ever failed me. Living in Manhattan all the years before moving to the ‘burbs in my mid 20’s, I’ve had my share of dining at some of New York’s best eateries. They ranged from hole-in-the-walls to restaurants where a meal can set you back the cost of a dining table (sorry, furniture enthusiast here)! It’s safe to say that I’m not drooling over Brewology because I know the owners. I’m drooling over this place because I’m a piggie I love food and it’s a big deal to me. This was such a tasty visit at Brewology. I have no complaints other than wishing I lived closer. Well, there is always hope for one opening in my neck of the woods. Until that happens, I cannot wait for my next visit! If you’re in the area and are looking for a great dining experience, check out their website here. Looks yum and I love the idea of a beer sampler! Love it!! I gotta go there!! If only I lived closer. This restaurant looks great and the food look even better. I was actually in the Hamptons last month. Too bad I didn’t know about this place! Looks like a great place with a good atmosphere. I love microbreweries! The tiny tobasco sauce bottles are a nice touch and I love the beer sampler but the chairs need to be changed. They don’t look comfortable at all. I didn’t sit on the metal chairs. They have wood benches along the wall too. I personally prefer cushioned seats. Maybe the idea is to not have seating too comfy that patrons stay there all day. ;). Thanks for commenting. These seem to be popping up everywhere! The food looks delish! What I fab place just so nice. I don’t really get into beer, nor does my husband, but I know that my brothers would love this place. wow that looks really good. i love waffles, so i would try the chicken and waffles first. I can’t wait to visit. This sounds like an amazing place to eat. The steak looks delicious and will try that when I go. Yes, that steak was delish! A very cozy place! I love the design of the bar. Even the food looks so delicious! What an adventure to open a restaurant! I love to see people making their dreams come true! Congrats! The restaurant looks really inviting- love the decor. My husband is in the Hamptons often for work, I’ll pass this post on to him. That looks like such a great place to eat and have a drink! I especially love their presentation for the beer sampler. I’ve never seen that before! Oh the food looks awesome and I can only imagine what a great experience it is to eat there. I love places like these. I recently went to a gastro pub in Quebec and it was so good. I love that these places pair the food to the beer and that they use local, seasonal ingredients. Love this review. Really well done. Thanks so much for your feedback, Margarita! Beautiful place, and love thename!! Thisdoes look great. My husband likes the beer samplers like that one pictured. Love the brand experience …. very smart! Very smart indeed. Those looks yummy. Eating there will be a pleasure with lots of good food and drinks. What an awesome place to eat and enjoy yourself. The food looks delicious. I love that they have the thing to hold your purse. I have never seen that before. Thanks for sharing. The entrees and the beer look especially delicious to me. I’d love to check this place out! The atmosphere looks really nice there. I love the lil’ bottles too., Whenever I go to a hotel and see the mini Tabasco bottles, I always have to get a couple extra. Over the past couple of years, I have started liking a nice beer with a steak meal. Tasty combination. The food looks awesome. The decor fabulous. If I am ever up that way I have to stop by. That place looks awesome. I love the shape of that light fixture. What a nice place. Would love to stop there sometime. The food looks SPECTACULAR. This is the kind of place I would want to go if I was visiting New York. Right off the bat I can tell my husband would LOVE this place! I just googled it and it’s like a 2.5 hour drive from us =( We might have to take a road trip! 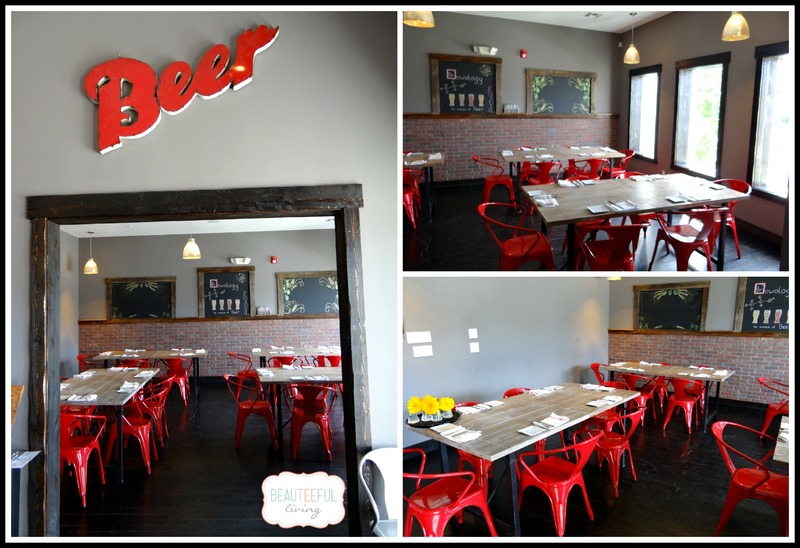 This is a great eatery for any foodie and or craft beer lover. What an amazing job you did revealing one of Long Islands new treasures. Bravo! I love the decor here! This place sounds like it would be the perfect place to visit for a good meal and drink. Whoa! Talk about swank!!! I love the way it’s laid out! I would go here in a heartbeat! Thanks for sharing. Brewology looks awesome! I love the decor, and the food looks amazing. If I’m ever in the area, I WILL be going. OOh, I would love to go! The decor is fantastic! One day i will get to the Hamptons and when i do i want to check out this place.. thanks for the education in it! I love the industrial look – I’m so glad it’s becoming more popular. I like to try the different beer samplers here. Their food looks really tasty too. I don’t drink alcohol, but I wish your family the best in this new endeavor! Looks like a fun place to go on a date! Wow, what a restaurant! I’m dying for a night out and I even see wine. Like above, if I only lived closer. At least I am in NY. That is totally my kind of restaurant. Man, I wish I lived closer – I would be there in a heartbeat.